Gas prices remain up there—latest national average is 3.72/gal, up $0.33 from a year ago. Though oil fell back a bit today the pressures on energy supply behind this recent spike remain in place, including geopolitics in Iran, some offline refineries, a bit of market speculation (nothing untoward, but it matters), and just general tightness in a tight system as demand recovers somewhat both here, and more portentously, in Asia (see Jim Hamilton, as always, for details on this). In terms of the overall economy, what you worry about here is a) oil is an important production input to everything we do, and b) higher gas prices mean less disposable incomes for people. Those are the dynamics behind the rules of thumb—the ones that say a $10 increase in a barrel of oil translates into about a quarter more per gallon at the pump, and, if it sticks, could shave 0.2% off of GDP growth. Not good, and why oil is #2 on my list of threats to the recovery (right after fiscal drag and before Europe). But there’s other stuff in play which you’d also want to consider, some of which should give you hope. Most of it is longer term, so it’s worth remembering that there’s little anyone could or should do to reverse price spikes like this, at least not in a knee-jerk sense (i.e., you wouldn’t want to release oil from the Strategic Petroleum Reserve every time there’s a price pop at the pump—that’s supposed to be for real emergencies, not political ones). 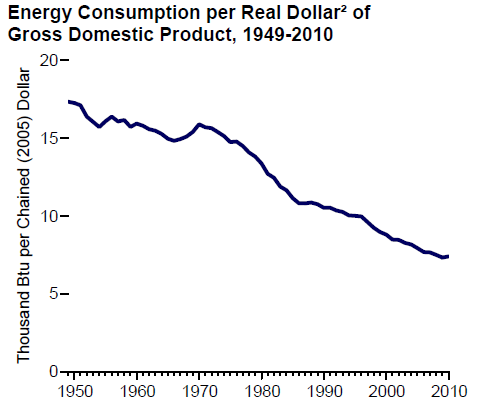 For example, here’s a picture of energy consumption per dollar of GDP, down about 60% over the last 60 years. It means we’re using energy more efficiently than we used to. 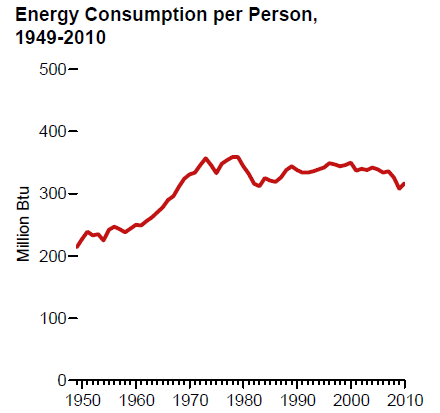 Here’s energy consumption per person, which isn’t going down, but hasn’t trended up either over the last few decades. Average fuel efficiency of cars, at least, is up by about half since the 1980s, though adding all those SUVs has obviously hurt us here. However, these data only go through 2009, and anecdotally, it’s said that consumers have been pretty aggressively shopping away from gas guzzlers. Like I said, there is such a thing as price signals. IE, the prices of a fixed commodity that’s heavily demanded, like oil, should go up over time, even with all the drilling and fracking going on out there. And one of the things that price increase is trying to tell us is to conserve more—to insulate our buildings, to increase our fuel efficiency, to develop renewables. But in order to hear what the price is saying, we gotta listen–we can’t just screech about how the President is to blame, we’ve got to drill and frack more, and somebody do something…anything…fast! I’m not trying to be a scold here–these price spikes hurt low- and middle-income families the most, not to mention folks whose jobs depend on driving (truckers, cabbies). In that sense, one of the the best things we could do right now would be to focus policy on jobs and paychecks of families still climbing back from the Great Recession (in this sense, the renewed payroll tax break should help offset the recent price spike a bit). 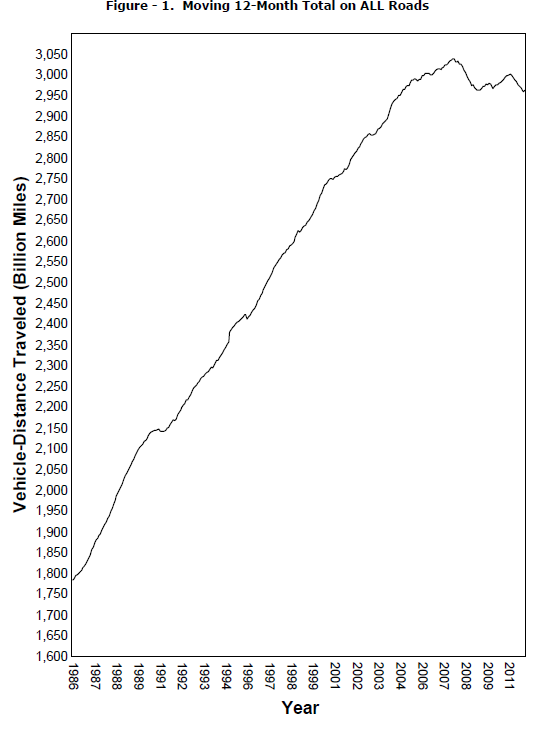 Finally, I’ve often pointed to the picutre below to suggest that folks ﻿﻿﻿﻿are just driving a lot less right now compared to any other time period in the figure going back to the mid-1980s. I’ve wondered if that’s largely recession related or a sign of a more elastic response to higher prices—i.e., drivers refusing to eat the higher costs and instead just staying put. I’ve crunched a few numbers and I now think it’s the economy, not a change in the elasticity, but there’s more work to be done here. So, am I saying that we’re out of the woods and that if gas goes well above $4/gallon no one will notice? Of course not. In fact, I crunched a few other numbers and found that if you regress the consumer confidence index on gas prices and include a dummy variable for when we went over $4 for a few months in 2008, you shave 2-3% off of the confidence index, which ain’t nothing (and that regression controls for unemployment and the general rising trend in gas prices at the time, so it does seem associated with crossing $4). All’s I’m saying is that it’s a good thing that we’re using energy more efficiently and that this—and not just drill/frack—is an important way to think about the longer term challenge of energy costs. Share the post "Energy, Price Signals, and Conservation"
7 comments in reply to "Energy, Price Signals, and Conservation"
Energy efficiency efforts? You bet, all the way. Going to be tremendously important in keeping demand manageable. It’s hard to imagine any break for families when they remain prey to the expectations of energy shareholders. Anyone know of a watchdog for utility rates nation-wide? Would be interesting to see price/therm in other parts of the woods. That chart looks like when 30 million unemployed people stopped making the 30 mile daily round trips back and forth to work. The important thing is that you are a Communist for suggesting that people should not waste energy. Thank You! This is another great article that helps us lay-people understand the issues in our economy. You a Communist ….. I don’t think so!!!!!!!!!!!!!! You are a Communist for suggesting that Dr. Bernstein is not a Communist. I work in Aviation and we live and die by the cost of fuel so it is something I have followed for at least a decade. last time oil was at these levels I would ask people “what is our largest un tapped oil source’? I would hear all kinds of answers other than the most obvious one conservation! It must be something about how are brains are wired or something. I currently live outside the US (Australia) and though gas is $5.50 a gallon almost never hear anyone comment about it. Bear in mind that the graph of energy intensity looks dramatically different if you pull out California, which aggressively pursued efficiency goals after the ’70s energy crisis. A very large portion of the reduction of US GDP energy intensity is driven by CA state policies.